This is an interactive map that illustrates the scale of potential flooding in Alabama, Mississippi, and Florida due to projected sea level rise. It is a collaborative project of NOAA Sea Grant Consortium and the US Geological Survey. It is a pilot project, so there is some possibility that the resource may not be maintained over time. Educators should use this interactive map in conjunction with the flood frequency predictions on https://gom.usgs.gov/slr/flood.aspx. 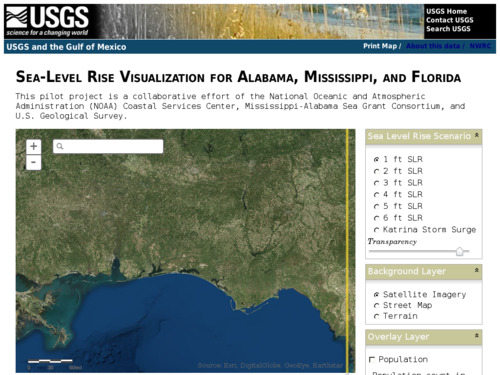 Visualization would need to be accompanied by additional learning resources, but offers students living in Alabama, Mississippi, and Florida the ability to directly check potential sea level rise in their area by address. Can spark discussions on the demographics of the areas most at risk of flooding on the Gulf Coast. This is a detailed visualization of the potential sea level rise in the Gulf coasts of Alabama, Mississippi, and Florida relative to the Katrina Storm Surge. The map illustrates the scale of potential flooding, not the exact location, and does not account for erosion, subsidence, or future construction. Water levels are shown as they would appear during an average high tide. Rising sea levels will cause daily high tides to reach farther inland. Comments from expert scientist: Allows any viewer to choose a location at multiple spatial scales, from regional down to street level, and to manipulate (or 'model') the potential flooding at that location due to possible incremental sea level increase. This interactive map is helpful to visualize the potential impacts of sea level rises of 1-6 feet on daily high tides on the Gulf Coast. The ability to zoom in and to add population and road layers is useful in understanding the human impacts of sea level rise on this particular coastline. Student can check to see if their location will be impacted by rising sea level. The simplicity of the design is direct but may fall short of usability over time and due to lack of applicability to a wider number of areas. As of now it only is useful for those living in Alabama, Mississippi, and Florida. Zoom in on a coastline before using overlays for best results. The overlays can be slow to load. Be patient if nothing happens at first.